I’d like to think that the characteristics needed to run ultramarathons can translate to other areas of everyday life. The attributes of determination and perseverance are important to finish a race, and I was able to apply those characteristics into the following experience at home. Let me ask you a question: what is your acceptable hair to salsa limit? I found out that mine is three. We bought some homemade salsa from the grocery store. The next night I was adding some to my guacamole when I found a long, stringy hair. I did what any average American male would do and pretended I didn’t see it. One long hair won’t ruin my salsa! Through running, I’ve learned perseverance and determination. I’m not just going to give up! So I start eating…and find another long hair. I’m kind of grossed out but I keep eating because, man, that salsa was good! A moment later I’m fishing yet another hair out of my mouth. By this time I’m angry. And yet, for some unexplainable reason, I keep eating. At hair number four I yelled at whoever made that hairy salsa and threw it in the garbage. Later I told my wife what happened. My daughters overheard and admitted that they accidentally spilled some salsa on the living room floor but then scooped it back into the container. Needless to say, I didn’t need to floss that night. There are, of course, far more impressive illustrations of people implementing the traits of determination and perseverance we learn through running. 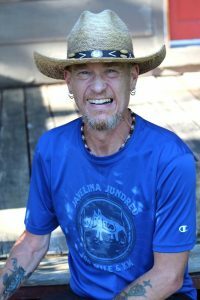 Among the top of my list of people is my friend Kelvin Reid, also known as the UltraCowboy. In October 2016, Kelvin was diagnosed with Lou Gehrig’s Disease (also called ALS). Kelvin told me that this rare disease causes him difficulty moving his muscles. It’s as if his muscles can’t think for themselves. He feels like there is a disconnection between what he wants his body to do, and what his body is willing to do. Admittedly, I struggled to understand a few parts of my conversation with Kelvin. Words blurred together and he struggled to express the crystal-clear ideas he was thinking. And it’s this very fact about his condition that leaves me so inspired. I couldn’t help but think “Kelvin’s body is being so uncooperative that he struggles to talk, and yet this guy is going out running!” He is the epitome of determination and perseverance. Kelvin Reid training on a warm June evening. Prior to his diagnosis, Kelvin was running around 300 miles a month, though right now he is running around 100. 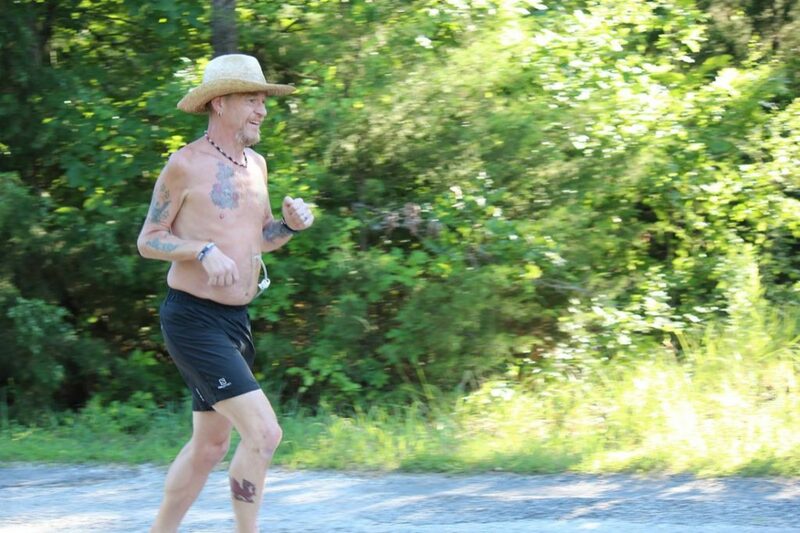 Despite the feeding tube coming out of his stomach, he still laces up his shoes to run. 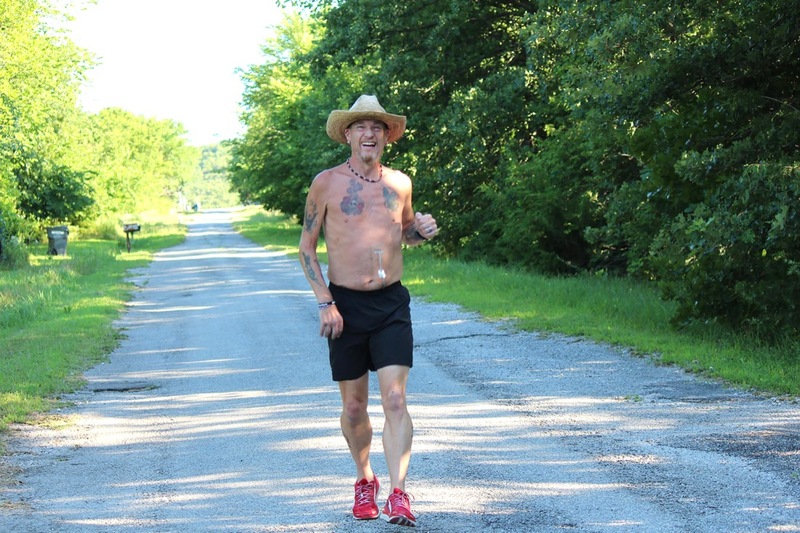 He said, “ALS is not going to stop me from doing what I love.” He has even signed up for another 100-miler in December. Kelvin Reid sporting a shirt from one of his 100 mile races. I’d like to think that the five 100-mile buckles Kelvin has collected over the last few years have prepared him for the current race he is running. And I certainly hope to say the same for myself when the challenges of life arrive on my doorstep. Running teaches us to be fierce. It teaches us to be strong and courageous and bold. And it gives our running a rich purpose when we can grab those characteristics of strength and courage and boldness and carry them into our daily battles. Maybe you’re battling addiction. Or grief. Or loneliness. Or sickness. Or depression. To you, I issue a challenge. Think back on a mile you were running when you struggled. When you had to dig deep. When you were brave and persistent and determined. When you kept fighting. You have that in you to face and overcome life’s battles. Now is the time to fight! But instead of lacing up boxing gloves, do what Kelvin does. Go lace up your shoes and run. This man owns great integrity, and grit and enormous courage. It is easy for each of us to dole out words of encouragement. We all have our health. I can’t even profess to know what it must be like to be in Kelvin’s head. What i do know is that we need to find a cure for ALS because it claims too many beautiful people every day. I don’t want to lose Kelvin. He is my friend and i love him dearly. As long as i have a voice and you have knowledge about this dastardly disease, then Kelvin has hope. Please join the crusade to be Kelvin;s purveyor of hope…..